Clarion Congress hotel Prague is easily and comfortably reached by car as well as by public transport. The excellent transport accessibility and the hotel's garage parking for cars and buses further increase the attractiveness of the Hotel even for individual guests coming to Prague for education and entertainment. The Hotel restaurants and bars, famous for their excellent cuisine - both Czech and international, along with the wellness and fitness centre and the shopping mall represent services open to the general public as well. Václav Havel Airport Prague is situated about 20km from the venue and it takes around one hour to get to get there. Take the nr. 119 bus (the bus stop is located directly in front of Terminals 1 and 2) to Nádraží Veleslavín. Change here and take the Line A underground train in the direction of Depo Hostivař to the Metro station Můstek. You need to transfer from the Metro station Můstek to the yellow line “B” in the direction to the Černý Most station and to get off at the Vysočanská station. Tickets can be bought in yellow sales machines (at the airport, in each Metro station) or at news stands for CZK 32 (approx. EUR 1). The easiest way is to use use the red metro line “C” from the Hlavní nádraží station in the Letňany direction to the Florenc station (1 stop, 2 minutes journey). At the Florenc station change to the yellow metro line “B” in the Černý Most direction and then get off at the Vysočanská station (9 minutes). Leave the airport and continue on the road 7 to K Airport. Take the road 7 in the direction of Prague-center / Ruzyně / Shopping zone. Continue on Evropská for 8.3 km and then transfer to Městský okruh. Go straight onto Povltavská, Sokolovská and Freyova. The Clarion Congress Hotel Prague will be on the right. Take highway D8 and then road number 8 in Prague, then take the E55 exit in the direction Hradec Kralove / Brno Circle. Stay on the left side of the road in the direction of Kbelská / Městská Circuit / Prague Ring Road. Turn right onto Kolbenova and then turn left to Freyova. The Clarion Congress Hotel Prague will be on the right. Follow the highway D5 to Prague. In Prague, follow the direction D5 / E50 to Bucharov. From the Rozvadovská clutch, take the exit towards Motol / Centrum. In Prague 6 drive from Bucharova, Kukulova and Pražský okruh to Městský okruh. Continue on Povltavska. In Prague 9, follow Sokolovska to Freyova. Follow highway D1 to Prague Center, turn right on Karlín and Vysočany and follow this highway about 5 km. After 5 km, turn right onto Českomoravská Street towards the O2 Arena. Continue about 1 km and turn left onto Freyova Street. After about 600 meters you will get to the Clarion Congress Hotel Prague ****. 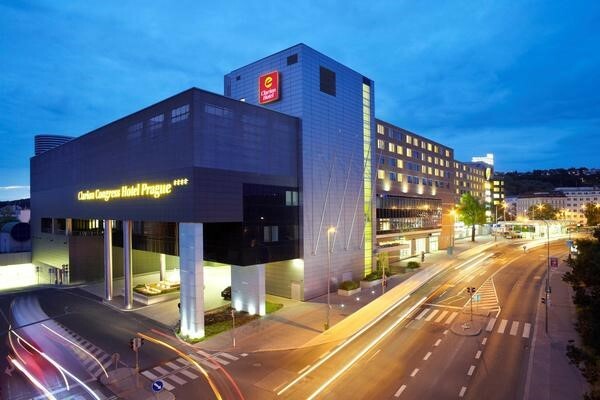 The Clarion Congress Hotel Prague is connected to the Phoenix Shopping Center, where is an underground parking with 600 parking spaces.